Linktoexpert.com : Get Chamber Membership ROI results! 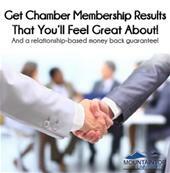 Get Chamber Membership ROI results! Description : If you have ever hesitated renewing your local chamber membership because you don't think it's a "good value" then you haven't read this informative e-book on ways to get a better return on your engagement.